Packaged water chiller Panels and frame are made from galvanized steel protected with polyester powder painting to ensure total resistance to atmospheric agents. Ceiling water chiller Single phase rotary type (mod.10÷35),3-phase (mod.40÷150) scroll type compressors, with built-in thermal overload cut-out and crankcase heater, mounted on rubber vibration dampers. Water loop water chiller High efficiency, double inlet centrifugal fan Protection level IP44. Low noise, low speed, big air flow and high ESP. Water to air water chiller High efficiency coaxial heat exchanger, factory insulated with flexible close cell material. R22 packaged ceiling water chiller Copper tube connection with charge valves, filter, capillary for mod. 10÷60(except Model 70 and above models, which use expansion valve) ; high pressure switch and low pressure switch. Underground water conditions: Water side water inlet/outlet temperature 18ºC/29ºC, Indoor temperature DB 27 ºC, WB 19 ºC. 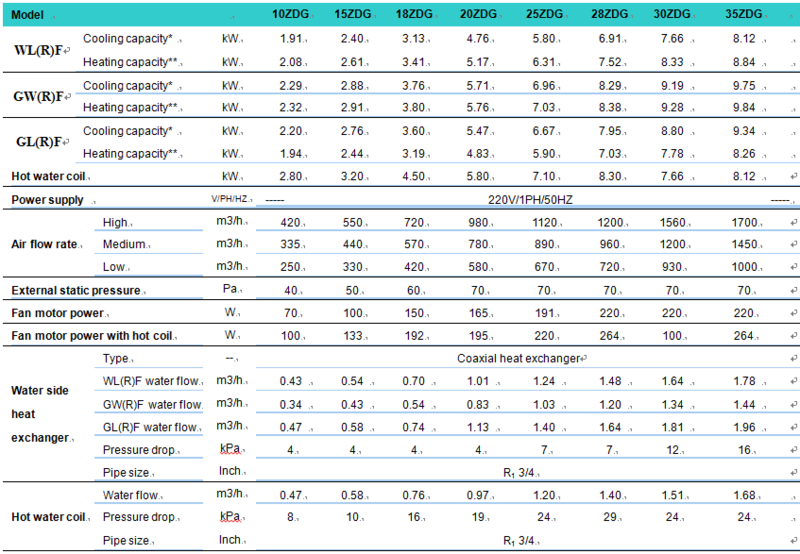 Underground loops conditions: Water side water inlet/outlet temperature 25ºC/30ºC, Indoor temperature DB 27 ºC, WB 19 ºC. 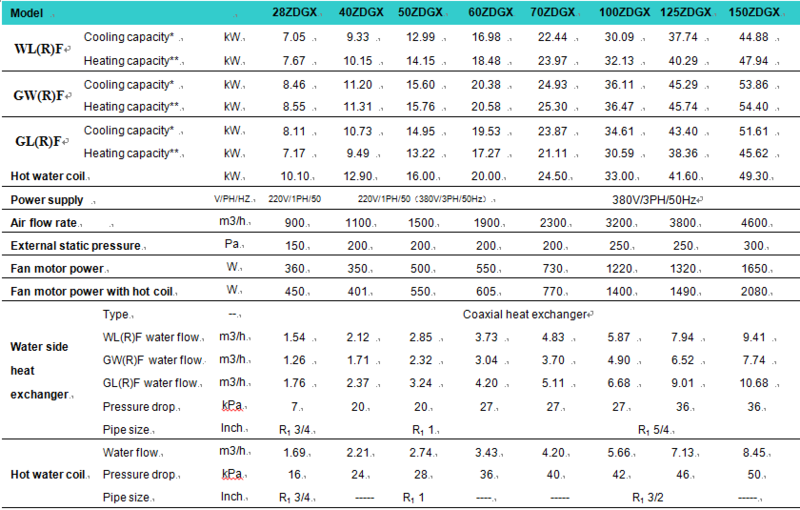 Underground water conditions: Water side water inlet 15ºC/, Indoor temperature DB 20 ºC, WB 15 ºC . Underground loops conditions: Water side water inlet 7.5ºC/, Indoor temperature DB 20 ºC, WB 15 ºC . 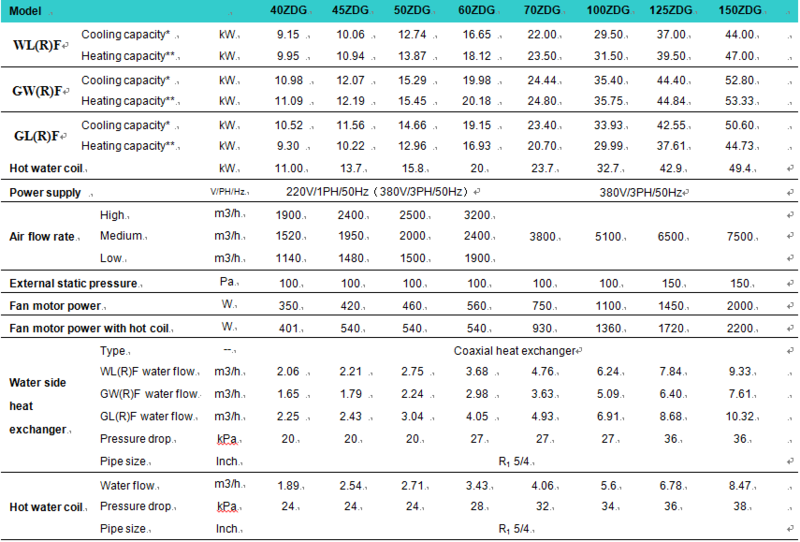 Water kit conditions: Water side water inlet/outlet temperature 30ºC/35ºC, Outdoor temperature DB 35 ºC, WB 28 ºC. Underground water conditions: Water side water inlet/outlet temperature 18ºC/29ºC, Outdoor temperature DB 35 ºC, WB 28 ºC. Underground loops conditions: Water side water inlet/outlet temperature 25ºC/30ºC, Outdoor temperature DB 35ºC, WB 28ºC. Water kit conditions: Water side water inlet 20ºC/, Outdoor temperature DB 7 ºC. Underground water conditions: Water side water inlet 15ºC/, Outdoor temperature DB 7 ºC. Underground loops conditions: Water side water inlet 7.5ºC/, Outdoor temperature DB 7 ºC.